The arbor is the best place for gathering around a cup of tea in the summer evenings. But this quiet and cozy place can be turned into a real work of art, make it festive, elegant and suitable for various celebrations and events. Let's start from the very beginning: how to arrange a summerhouse? There are two options for obtaining a beautiful design of the gazebo. The first is to apply to a special agency, where professional florists and decorators work. This option is very simple, but not everyone has to afford. The second option - decorate the gazebo with your own hands! In this case, it will turn out to be quite individual and how to be said "with the soul". But for this, you need to know certain rules. The first rule: you need to divide the process of decorating the gazebo into several stages. 1) Interior design - interior decoration. This design includes the selection of dishes, textiles, furniture, curtains, lamps in the same style. 2) Exterior - decoration of the gazebo itself: entrance, roof, fence. You can also paint an arbor with special silicone paints and decorate with interesting decorative elements. 3) Registration of the adjacent territory. Next to the gazebo, you can arrange additional places for recreation, greening the territory, think out the outside lighting, decorate the path to the gazebo. But before you start this stage, you need to first determine the style of decor. After all, there are many different techniques of decoration and various styles. 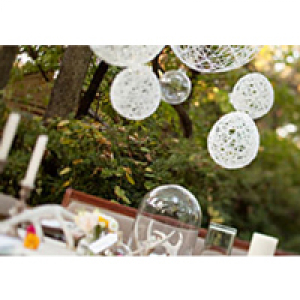 For example, you can decorate the arbor with flowers, light fabrics, balls, letters, etc. To initially choose the style of the gazebo, you must also build on not only your taste preferences, but also the appearance of your yard or garden, the landscape. On the Internet there is a huge number of interesting and creative ideas for the design of the gazebo. In principle, if your imagination refused to participate in the decorating process, you can always find something interesting and really worthwhile. Now it has become very popular to decorate gazebos with balls (and not only gazebos, this design looks spectacular and stylish in any place where the holiday is held). Of these balls create even full-fledged compositions, figures. With the help of aerodesign you can create not only a stylish decor, but also very pleasant to surprise guests. After all, these wonderful balls look quite unusual, so just indifferent will not leave anyone! But this design is actual, if you have any holiday and you wish to create a festive atmosphere in this way, add charm. Feel yourself a real florist and make an amazing flower arrangement of the gazebo. Compositions of fresh flowers will become an incredibly beautiful ornament of any arbor. Depending on the choice of colors, you can create a different atmosphere for the gazebo. Use a curling rose to create an easy, romantic atmosphere. Delicate rose flowers are very airy and lush, so everyone will like it. In addition, a huge plus is their resistance to any weather. Decorate the outside of the arbor with honeysuckle. This plant has more than 50 species. Depending on the variety, honeysuckle lianas can reach five meters in height. The greatest advantage of honeysuckle is its unpretentiousness and stability, it does not require any special and careful care. You can also use perennial plants to decorate the gazebo. After all, such plants are not afraid of bright sun rays, and they are also a reliable protection against bad weather.